This popular deluxe cottage sleeps 2 and has one bath. glass screened doors overlooking the exotic organic permaculture orchard, gardens and almost 180 degrees of open ocean, cliffs and waterfall(S) If this open concept cottage is unavailable based on VRBO's calendar, then check our other 2 Hale Kukui properties on the same ocean cliff exotic orchard 5 acre paradise through VRBO property numbers 499549 (2 bedroom cottage) and 499551 (Studio Cottage). to book up to all 3 cottages for up to 12 or more people. Discounts may apply. Southeby's international real estate magazine cover photo features the view from the property. 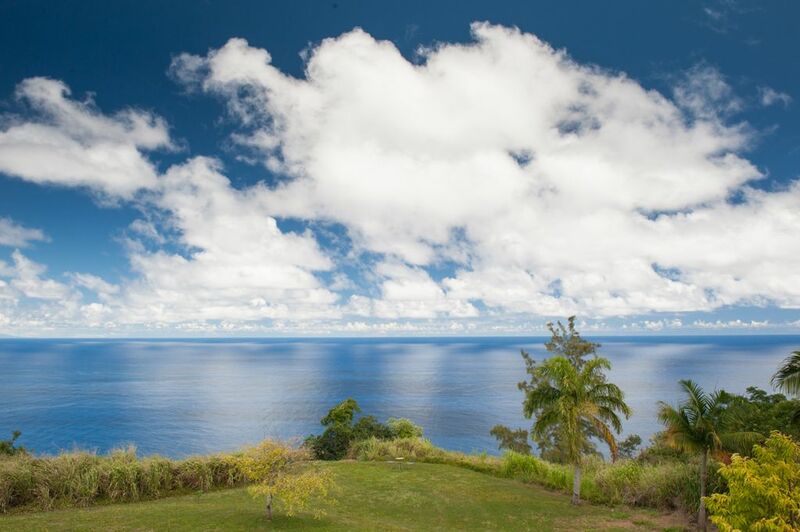 This magnificent 5 acre permaculture organic exotic orchard retreat sits back on 650' cliff above Waipio Valley, and looks to the ocean Southeast, North and Northwest up the undeveloped rugged coastline. Sometimes there are a multitude of waterfalls seen cascading down 1400' cliffs into the sea. Gaze at lush greenery, frequent rainbows, especially during the wet season (Winter/Spring). Epic views face 23 miles of these 1400' cliffs, backed up by undeveloped jungle. Whales jumping and breaching can be seen from the property during the winter/spring. Maui is visible on clear days. The area boasts a perfect climate of just enough rain to keep the streams going and the flowers blooming, cool trades off the ocean, and a daytime year-round temperature typically between 70 and 81 degrees, with cooler nights. The property is landscaped with a vast variety of exotic trees, ferns, orchids, orchids, heliconia, hibiscus, palms, other flowering shrubs/plants and exotic fruits to pick. We are in the early stages of growing Vanilla, Cocoa,dragon fruit, black sapote (Chocolate pudding tree), Cashew and Macadamia nut trees. hamakua coast coffee beans, mangos, mangosteens, avocados, pomelo, Jackfruit,papaya, passion fruit, soursop, rambutan, lychee nuts, starfruit, Brazillian cherries, jaboticaba, cherymoya, mountain apples, true cinnamon, cloves, Miracle berries, a variety of citrus, bananas and much more grown on the property. Walk along the cliff's edge/ocean path or explore the path through bamboo. Both short easy walks take you to an opening on the picturesque lawn going down to the cliff's edge. Take another short steep path (for sturdy feet only) past the Banyan tree and passion fruit vines into the gulch on our property. Listen to the peaceful sounds of the Waiulili Stream running through the property. Black Sand beach seen from the property. Ocean and waterfall views abound. Enjoy the peace and privacy of your own suite complete with private outdoor soaking tubs to relax in and enjoy the stars. Staying at Hale Kukui is an ecoadventure and an end destination in itself! It is also a great jump off point for other destinations! This uniquely stunning property is unique for its historically important location, for its short paths, private nooks, exotic organic orchard, unmatched views and size/character of property. **If our deluxe cottage calendar appears booked, then check into our studio cottage and our 2 bedroom cottage's availability. All 3 cottages are situated on the same 5 acre property with similar views. Look up VRBO's property #499549 (2 bedroom Cottage), and #499551 (Private Studio). Consider staying in all 3 for larger groups, small weddings, cycling, photography or hiking groups or family reunions. If calendar is 'emptyish' then it may not be reflecting the bookings through our website or by phone. Overview of the neighborhood: Old Hawaii meets modern conveniences, safe, private, lush natural beauty and most of the comforts of home. If you are able to pull yourself away to see other parts of the island, Hale Kukui is a great stepping stone to the whole island. Walk or drive 1.5 miles to the black sand beach below property and down a 25% grade road(4x4 required to drive) or 1/4 mile to Waipio lookout. Walk 1/4 mile to get island made ice cream at Kukuihaele's art store. Its an easy 10 minute drive to the farmer's market in Honoka'a where there are several quaint shops, restaurants and basic groceries. Try local ride the rim, surfing, biking, helicopter tours of Waipio Valley, horseback, hiking, camping and enjoy the longest black sand beach in Hawaii where a river meets the sea, surfing and sunbathing in historic Waipio Valley. Drive to Hawaiian cowboy country in Waimea and you can smell eucalyptus on your way to the cooler climate in Waimea (Kamuela). Here there is more shopping,fast food chains, a bigger hospital and some of the best fine food in the islands (only 20 minutes away). Go to Merriman's for the best seafood and Kailua pork quesadillas. Hale kukui is fairly central to Kona, Hilo, Volcanoes National Park, Hot Springs, the entire lush Hamakua coast starting at Waipio and its black sand beach where wild horse sometimes are seen. A beautiful drive to the top of Mauna Kea with its observatories, winter snow skiing/no lifts (tallest mountain in the world measured from the sea floor and 14,000 ft above sea level). Drive on to the white sand beaches about 20 minutes from Waimea, the 5 star hotels and high end shopping of the west coast. Driving east along the lush Hamakua coast, see Akaka falls, the world famous botanical gardens, Hilo, Volcanoes National park, Natural hot springs in Pahoa. Take the saddle road between Hilo and Waimea and drive to the 14,000 top of Mauna Kea along the way (many countries have their space observatories there). Visit Kona and see if you think the preferred coffee of the white house is really as good as the lesser locally known rich tasting Hamakua coast coffee. Hale Kukui grows small amounts of its own and while we don't dry and roast it, you are welcome to try. Hilo and Honoka'a have great outdoor markets and shopping. Nearby surfing and boating is possible of course. and it is a beautiful 1 hour drive along the Hamakua coast. Must see Volcanoes National Park and swim in the hot springs in Pahoa. Kona is about 1hr 40 minutes away along very nice highways as are most places. The whole island has so much to offer but you will definitely want to relax at Hale Kukui for its unmatched epic views and natural private surroundings. Each unit or cottage has its own kitchen/kitchenette ready to cook, full bathroom, private lanai with a soak tub outdoors . You may not want to leave. Hello. My name is Andy and I have a ten year old daughter named Hana. We love our paradise in nature and feel surrounded by serenity, beauty and an energy that is powerful and unique to our property. I have always had a passion for the ocean, exotic fruits and for gardening so this organic orchard on the ocean was the perfect find in 2009. I love adding new and more interesting specimen Palms, fruit trees, coffee, nuts, spices, cocoa and flowers such as vanilla bean orchids to the nearly 5 acre retreat. My latest interests are Dragon fruit, Hamakua coast coffee, rare orchids, heliconias and spices like true cinnamon and cloves! I am also interested in the medicinal benefits of various botanical's and I have a background in science as a doctor of Osteopathy board certified in both Internal Medicine and Emergency Medicine. We recently created a common room that may be available(check with Paula) for people to talk, read, meditate, receive massage (several therapists available) or do yoga. This is the 'Zen Space.' Consider organizing your own healing retreats here at Hale kukui. Relax in the Hammock outside with ocean views, spectacular orchard, waterfall and cliff views to sooth the soul. I am most at home in nature. I am a world traveler and have never seen such beauty as I do at Hale Kukui and I have seen nature at its finest in Switzerland, Fiji, CA, New Zealand, Bali, Europe or Australia. I also love where I am from in New England. I grew up in Maine where people are down to earth like they are in this historic part of Hawaii. I have traveled the world and haven't seen any property that matches the tranquil solitude and beauty seen here. It is nicely located to explore the best attractions on the island, but you might not want to leave the 5 acre botanical paradise over-looking the sea.I would prefer the charm of Hale Kukui to any BNB or 5 star hotel that I have ever stayed at in the past years of travel home and abroad. You will feel at home, but more relaxed than ever, not just as a guest but as an integral part of Hale Kukui's natural earthy beauty with ocean, cliff and waterfall views that are second to none. Caretakers Paula and Dan are eager to help with any questions or special needs during your stay - they live in a separate house on site. Kitchens are equip in case you never want to leave as many people find themselves feeling very early into their stay.You will feel in awe of your natural surroundings, wake to seeing the ocean and have so much to explore. Hawaiian permaculture organic orchard with fascinating and delicious exotic botanicals. You will not want to leave and you will definitely come back! Lush rural private atmosphere 1/2 mile to Waipio Lookout. Shopping and other amenities nearby. Kukuihaele is a small village town with a General store with delicious island made ice cream within a 1/8-1/4 mile short walk. Honoka'a and its quaint artsy atmosphere is only 10 minutes away. Cliffs with waterfalls seen from cottages. Mountains seen in Waipio Valley. Property comes up to cliff's edge and looks at the cliffs and ocean. Spectacular view through a wide spance of screened sliding glass doors across the front of the cottages. Extensive 5 acres of organic permaculture fruits, nuts, spices. Cliff edge may be unstable so we recommend staying back at least 10 Ft or more- not appropriate for unsupervised children. All cottages have Private lanai's (decks) with private soaking tubs with unmatched epic views! We stayed in the cottage at Hale Kukui for the start of a long family vacation, before meeting up with the rest of my family. It was a wonderful way to wind down from work before all the family action, with the great hike to the beach in Waipi'o from the front door, the comfortable cozy places to relax during the rainy times, the great fresh fruits from the orchard, beautiful sunrises and sunsets, stargazing from the soaking tub, and gecko entertainment. We had everything we needed to cook most of our own meals, and I'm sure Paula and Dan would have provided more if we needed anything. You won't find a more gorgeous view! Even though it rained much of the time we were there, it was still gorgeous and away from all the noise of the touristy areas. Dan was an excellent host as well. And the nearby adventures in the valleys were amazing as well. Definitely worth the money! Thank you for an excellent stay! cant say enough. its a beautiful spot , peaceful, with great owners and caretakers. Andrew your property is in a very nice location. Considering the cost to rent this property we thought it needed more maintenance. The tub that is referenced in your ad was full of tree debris...who would use that; mold on railings and deck floor...I know it's wet there but maybe have the windows cleaned as you are selling a view..dirty screens and windows don't do anything for us. No hot water the first night. We understand you have hot water on demand but after running for 15 minutes we gave up and contacted caretaker at 7:30 AM. It was nice that there was a dehumidifier and a heater to make the stay more comfortable; there was adequate kitchen utensils and towels. Good areas to have walks if you can do hills..we live in the mountains so it wasn't a problem...others might. I'm so sorry to hear disappointment. You came and told us about the water not getting hot at about 7:30am and that fixed within minutes of you contacting us. I wish you would have voiced your disappointment concerning the screens & windows. We could have had an opportunity to remedy the situation then. I did mentioned the frogs during the check in process. I offered packages of earplugs,I was told you have your own. Concerning the soaking tub on the lanai. In the confirmation email I send out , I ask for a general arrival time. That is asked for several reasons,guests requesting late check outs, which cottage needs attention first and to make another lanai cleaning and a final cleaning of the soaking tub. The tubs sit out in the open for optimal viewing /star gazing , we are surrounded with ironwoods and other trees so there is constant debris falling. The tubs are completely sanitized and clean before check in. Paula and Dan are wonderful hosts! We arrived to a plate full of fresh picked fruit from the orchard and a friendly smile. This is a wonderful location to relax and get away from it all. Hiking down Waipio Valley is a must and will make for a wonderful memory. Yes...there really are wild horses down there. The cottage is clean and open with everything you need to make your stay enjoyable. Great people. Beautiful property and views. Sounds of nature everywhere. Only downside is that it's about 1.5 hrs from Hilo and Kona but would definitely recommend to anyone looking to escape. Hale Kukui, in the village of Kukuihaele, is a great stepping stone and a majestic destination itself on the Hamakua coast. Walk or drive 1/4 mile to the Waipio lookout. Travel another mile down the side of a mountain/cliff on a 25% grade narrow road (4x4 required to drive) to the longest Black sand beach in Hawaii. Enjoy remote camping or hiking in Waipio valley and the valleys beyond. Embark on horseback riding, surfing, hiking, camping and much more locally from our village, Kukuihaele. Hale Kukui is a short easy walk to Kukuihaele's Art store with island made ice cream and a place to meet for getaways into Waipio Valley. A 10 minute drive to Honoka'a offers a weekly farmers market and a few great places to dine. Check out this quaint village's shops. Here is a small hospital/clinic as well. Great shopping and some of the best restaurants in all of Hawaii are in the old Hawaiian cowboy town of Waimea (Kamuela) about 20 minutes away. There is a community hospital as well. Hilo also is a beautiful 50-60 minute drive along the Hamakua coast and has all of the amenities you might want. White sand beaches, 5 star hotels with high-end outlet shopping, botanical gardens and Akaka falls are all within an hour drive. Kona with great scuba, snorkeling, shopping and of course its coffee is about a 90 minute drive. Volcanoes National park and natural hotsprings are about 2 hours away. Also not far out of Waimea, you can drive to the top of the world's tallest mountain from the sea floor, Mauna Kea (14,000+ ft above sea level). Play or ski in snow at the top in the winter months. **If our deluxe cottage calendar appears booked, then check into our studio cottage #499551 and our 2 bedroom cottage's #499549availability. All 3 cottages are situated on the same 5 acre property with similar views. Consider staying in all 3 for larger groups, small weddings, cycling, photography or hiking groups or family reunions. If calendar is 'emptyish' then it may not be reflecting the bookings through our website or by phone.